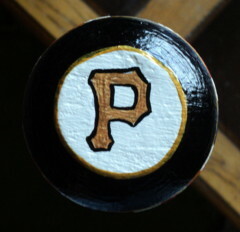 This Legends Hand Painted Roberto Clemente Bat features my original paintings of the Pittsburgh Pirates Hall Of Famer. Side one has my close up painting of Roberto Clemente. Flag style bunting surrounds the top of the bat. Click here for a closer look. You'll also see "PIRATES" in black and gold on the front along with Roberto's famous #21 and the Pittsburgh Pirates logo. 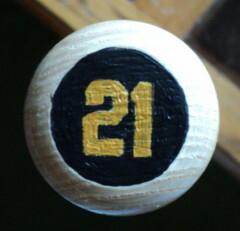 The back of the bat has my action painting of Clemente along with his hand painted name. Click here for a closer look. You'll also see my signature, the date this bat was completed and "1 of 1". This means that this is number one in a series of only 1. I'll never paint another exactly like it. 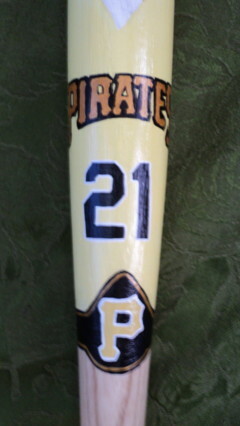 The top of the bat has my hand painted Pirates logo trimmed with black and gold. The knob of the bat has Roberto's number 21. The handle of the bat has been left natural wood. This is a genuine, full sized, 34 inch, Rawlings wooden baseball bat. Contact Me To Purchase A Similar Bat. Shipping is FREE within the Continental United States. Please add $12.50 for International Shipping when ordering (Includes Hawaii, Alaska and Puerto Rico).